The River Hawks ended their season with a loss to Notre Dame in the Northeast Regional Final on Sunday, March 26, finishing with a 27-11-3 record overall. UMass Lowell will be bidding farewell to an accomplished senior class that will surely be missed on and off the ice. The class includes defensemen Dylan Zink and Michael Kapla along with forwards Joe Gambardella and Evan Campbell. Zink and Gambardella were just named to the New England Hockey Writers All-Star team following the season. “[The seniors] helped strengthen the culture of success and to continue they had a hell of a legacy… Over their four-year career they had 11 trophies and that’s a heck of a testament to the type of character there is in that class. They’re all going to graduate on time and three of them are over 3.5 students. You can’t ask for better kids,” said UMass Lowell head coach Norm Bazin. “We’ve won a lot of games here and we have had a lot of success, but most importantly being able to have a good time and enjoy each other. I think it’s been a really fun ride,” said senior captain Michael Kapla. Along with winning the Hockey East regular season title, the River Hawks went on to win their third Hockey East playoff championship in the last five years. They also added their fifth Alumni Cup in a row and another trophy in the Ledyard Bank Classic. The River Hawks finished their regular season at 14-7-1 in Hockey East, a conference at the upper echelon of college hockey. “I am very proud of this group… the 22-game regular season is brutal in Hockey East and anybody can beat anybody,” said Bazin. Outstanding play from the top line contributed to the great season. Juniors C.J. Smith and John Edwardh paired up with Gambardella accounted for 59 goals and 140 points, about 35 percent of the team’s offensive output. Gambardella came in clutch all season, tying Kory Falite for the school’s single season Division I record of seven game-winning goals to go along with his team-leading 52 points. His efforts this season earned him the Walter Brown Award awarded to the best American-born player in New England, a first for a UMass Lowell player. Gambardella signed a two-year entry-level contract with the Edmonton Oilers that will take effect in the 2017-18 season. Smith also recorded over 50 points with his 51-point season. The River Hawks will lose Smith as well this off-season as he has signed an entry-level contract with the National Hockey League’s Buffalo Sabres. Looking towards the future, River Hawk fans can place their faith in freshman goalie Tyler Wall. Wall had an outstanding season for a freshman goaltender, recording a .918 save percentage along with a Division I River Hawk record of 26 wins. Wall earned himself Hockey East goaltender of the month in the all-important month of February. He also made the Hockey East all-tournament team for his play in the River Hawk’s championship run. Freshman forward Ryan Lohin had 29 points this season and showed his skills during the NCAA Northeast Regional. Scoring three points in the two games, Lohin earned himself a spot on the All-Tournament team. Look to see Lohin move up a line or two as he returns for his second year in blue. Freshman defenseman Mattias Göransson also put his offensive talent on display by scoring five goals and 23 points total. The Slottsborn, Sweden native showed poise and confidence for a freshman all season long. With talent in each class, the River Hawks will look to continue their success next season. After an adversity-packed season of ups and downs, the team will be ready for anything come October. 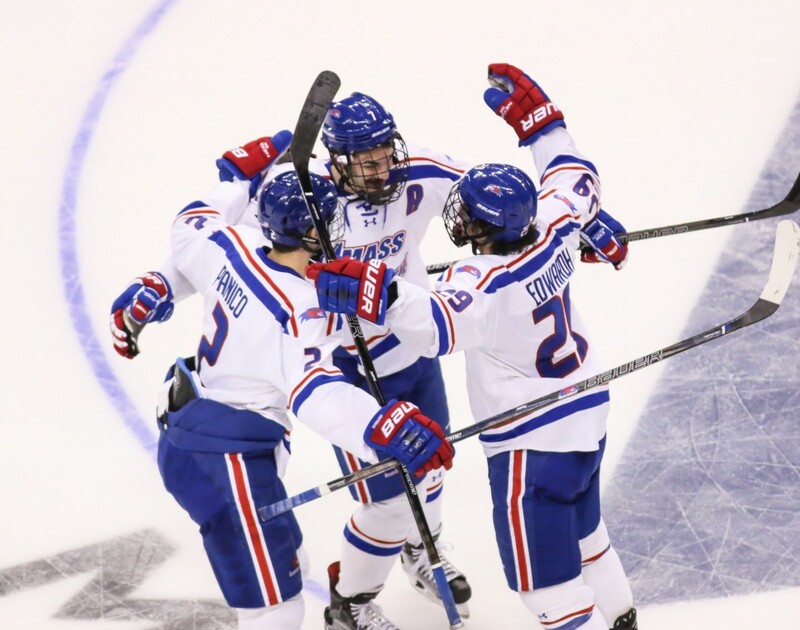 The River Hawks took home the Hockey East Championship, but barely missed out on their second trip to the Frozen Four as a Division I program. “I felt that the group inside that locker room was good enough to be the best team at the end of the year,” said Bazin.